492 / 376 / 434 mm 19.4" / 14.8" / 17.1"
Here you will find an overview of the standard accessories for the BERNINA 325 and BERNINA 335. Overlock sole #2 lets you neaten seams easily and sew high-quality hems, waistbands and overlock seams on knit fabrics. Blindstitch sole #5 is designed for sewing blind hems on all fabric thicknesses for a barely-visible finish. Open embroidery foot sole #20 is ideal for decorative stitching with your sewing machine. The indentation in the sole of the presser foot allows it to glide smoothly over dense stitches. Standard adapter shank #75 permits the easy attachment of accessories for various sewing techniques to preferred sewing machines. 58 compatible presser feet give room to grow with the BERNINA 335. All the sewing support you need for any occasion! Meet your support team! Blindstitch foot #5 is designed for sewing blind hems on all fabric thicknesses for a barely-visible finish. Tailor-tack foot #7 is suitable for marking seams on the fabric. It can also be used for attractive decorative applications such as 3D effects, fringing and fagotting. Jeans foot #8 produces neat straight-stitched seams on tough, heavy fabrics such as denim, leather or canvas. Edgestitch foot #10 is ideal for topstitching, hemming and embellishing. Its special guide blade helps you sew perfectly straight seams. The special design of the BERNINA Cordonnet foot #11 enables precise embellishment and topstitching with cordonnet thread as the upper thread. Bulky overlock foot #12 is suitable for sewing knits, as well as for making and attaching piping and cords. Gathering foot #16 is a wiz at gathering fabrics. If needed, it can sew a flat piece of fabric to a second piece of fabric while gathering the latter – in a single operation. Braiding foot #21 is ideal for creating stylish couched-cord embellishments with a consistent stitch pattern. With its grooves and swing-out latch, Cording foot with 3 grooves #22 is ideal for the simultaneous couching of several strands of cording or yarns. Appliqué foot #23 lets you sew even dense rows of stitches without a hitch – ideal for appliquéing and sewing mini-piping, as well as for traditional sewing techniques. Cording foot with 5 grooves #25 is ideal for the simultaneous couching of several parallel strands of yarn or wool thread. Thanks to its special tear-drop shape, Drop-shaped embroidery foot #26 allows you to embroider with the embroidery module and to darn delicate fabrics. Pintuck foot with 3 grooves #30 is used when sewing pintucks with a double needle. The grooves enable you to sew parallel tucks. Pintuck foot with 5 grooves #31 is specially suited to sewing pintucks on medium weight fabrics when using a double needle. Pintuck foot with 7 grooves #32 sews fine pintucks on light and medium weight fabrics and is a practical helper with smocking and entredeux. Pintuck foot with 9 grooves #33 is especially suited to sewing pintucks with a double needle on very delicate fabrics. Patchwork foot #37 features engraved markings for all your ¼" needs. The straight stitch opening is ideal for patchwork and precision sewing. The right side of Piping foot #38 is higher than the left side, allowing it to ride more easily over thick layers of fabric and sew mini-piping and trim. Embroidery foot with clear sole #39 provides a clear view of the stitching area and is an expert in decorative stitch patterns, appliqué, and satin stitching. Roller foot #51 ensures even fabric feed on difficult fabrics. Thanks to its rollers, it glides easily over "sticky" materials. Thanks to its non-stick coating, Zigzag foot with non-stick sole #52 glides effortlessly over "sticky" materials such as leather, plastic or vinyl. Straight-stitch foot with non-stick sole #53 makes it easier to sew "sticky" materials, ensuring an even, pucker-free straight-stitch. Zipper foot with non-stick sole #54 sews zippers to "sticky" fabrics, producing exactly parallel seams as it does so – thanks to its guide. Leather roller foot #55 rolls over the fabric, enabling neat, even stitching on difficult or "sticky" surfaces. Open embroidery foot with sliding sole #56 is suitable for appliqués, Richelieu embroidery, or following patterns on "sticky" fabrics. The two 6-mm grooves in the sole of Double-cord foot #59C enable the simultaneous couching of two parallel cords. This foot is also ideal for sewing piping. In addition to sewing piping, Double-cord foot #60C enables the quick, even couching of two parallel strands of cording. Zigzag hemmer #61 turns the fabric edge under twice and sews it with a zigzag stitch to produce a narrow, sturdy hem. The width of the channel in the sole of Straight-stitch hemmer #62 corresponds to the width of the finished hem, making this presser foot ideal for narrow hems. Zigzag hemmer #63 is ideal for sewing double-turned hems on fine fabrics. With Straight-stitch hemmer #64 the fabric edge is turned under twice and sewn with a straight-stitch to form a 4 mm wide, compact hem. By turning the fabric under twice, Zigzag hemmer #66 enables precise stitching and a sturdy hem in medium weight fabrics. Roll- and shell hemmer #68 is suitable for hemming soft fabrics. Its 2-mm guide produces a decorative three-dimensional hem. Roll- and shell hemmer #69 is suitable for hemming soft fabrics, such as tricot T-shirts. Lap-seam foot #70 enables you to sew precise lapped and flat-felled seams in light and medium weight fabrics, and is also suitable for reversible clothing. Lap-seam foot #71 lets you sew up to 6 mm wide flat-felled seams in two steps on jeans and sportswear. Ruffler #86 is specially suited to gathering and pleating fabrics. The density and depth of the pleats can be set. Binder attachment for unfolded bias tape #88 makes sewing neat, even edge finishes a cinch. Binder foot #95 for Binder attachment #87 and #88 makes it easier to sew edge finishes with bias binding. The Suitcase L is designed to be solid and lightweight. It is compatible with the BERNINA 2, 3 and 5 Series. The advanced padding system and the high-quality outer material provide a thorough protection for your sewing machine. Short adapter shank #77 is especially suited for attaching presser feet with a short shank. The 5.5mm PunchWork stitch plate is suitable for needle-felting with your sewing machine. The PunchWork stitch plate is particularly suitable for needle-felting on rotary hook sewing machines. The large Plexiglass extension table increases your work space when sewing large quilts. The fabric feeds like a dream over its smooth surface. Circular embroidery attachment #83 lets you embellish perfect circles or semicircles of various diameters with utility or decorative stitches as well as lettering. Eyelet embroidery attachment #82 with foot #92 lets you punch and embroider decorative and functional eyelets. The Right and left seam guide is a useful aid for producing straight seams on needlework, home furnishings, and garments. With the help of two plates, the Fabric-feeding aid for sewing buttonholes increases the area of the presser foot, enabling easier feed on difficult fabrics. The Buttonhole leveler makes quick work of sewing buttonholes on fabric edges and on fabric layers of different thickness. The Buttonhole cutter with wooden block requires only slight pressure to cut open finished buttonholes, without damaging beads and bartacks. The Knee lifter/Free-Hand System (FHS) lets you raise the presser foot and lower the feed dog with your knee. Recommended particularly for appliqué or any project requiring pivoting and getting bulky projects under the presser foot easily. Serving as an additional thread guide, the Guide eyelet for metallic and silk thread stops the thread from slipping off the spool during the sewing process. The Thread-lubrication unit improves the gliding properties of metallic or loosely twisted threads with the aid of silicone fluid. 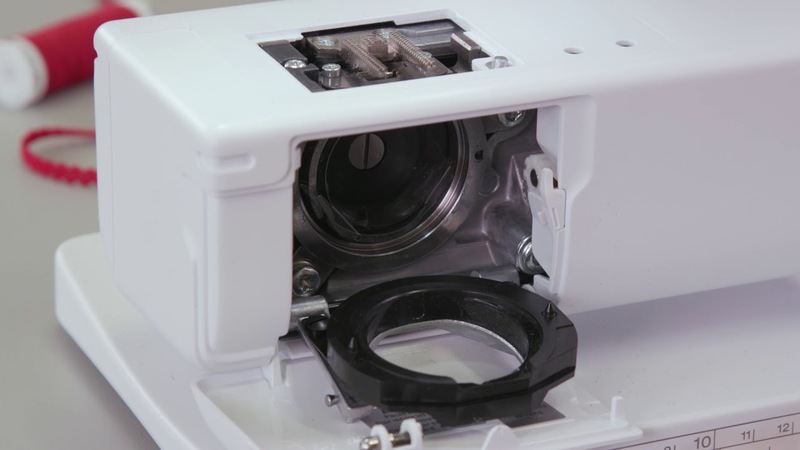 The Magnifying-lens set consists of a machine mounting bracket and three lenses of different strengths for optimal magnification of the work area. 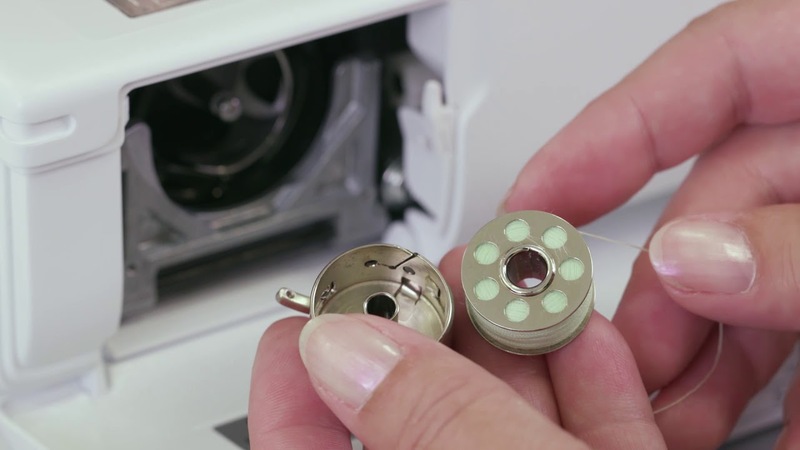 This video covers everything you need to know to get started with your BERNINA 335 or 325, from attaching the sewing foot, winding the thread and using the spool, through to threading the machine correctly. Sewing with the BERNINA 335 and 325: Adjusting stitch width, stitch length, thread tension etc. This video shows you how to adjust thread tension, how to change stitch width and stitch length depending on your sewing project and how you can adapt the stitch balance to make your stitches look perfect. The videos also coverst he use of the needle stop function. The 3rd part of our video tutorial series on the BERNINA 335 and 325 shows you how to combine stitches and save stitch combinations for later use. See step by step how to combine alphabet stitches and decorative stitches. Following this tutorial you can label bags, clothes and cushions with individual lettering and patterns. 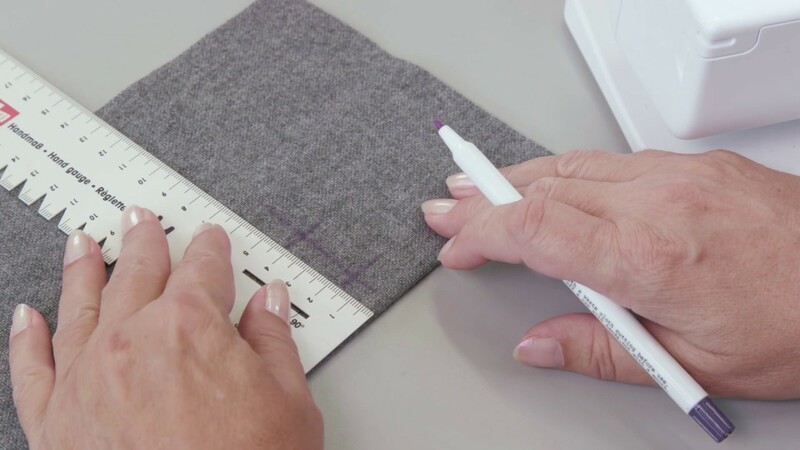 In this video tutorial you will learn how to sew accurate buttonholes with the BERNINA 325 and 325. The video will guide you through the process in a couple of easy steps, from the simple mounting of the presser foot through to reinforcing the fabric, selecting the buttonhole, adjusting stitch width and the finished buttonhole. Cleaning and oiling is important to keep your BERNINA machine running in top condition. Every machine works better with regular maintenance. In this video, we will show you how to correctly clean your machine and how to oil the hook race. “I know I have a new best friend with the B 335.” Annika Victoria is young, talented, creative and crazy unique. The YouTuber from Sydney, Australia, knows exactly what her sewing fans want: uncomplicated patterns that are fun to sew. 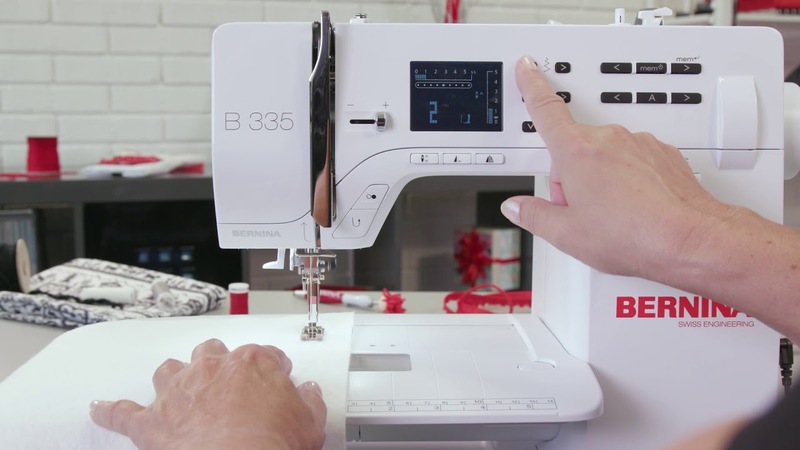 And, as this video shows, her BERNINA 335 is the go-to partner she can count on. She loves her BERNINA 3 Series. You will too! 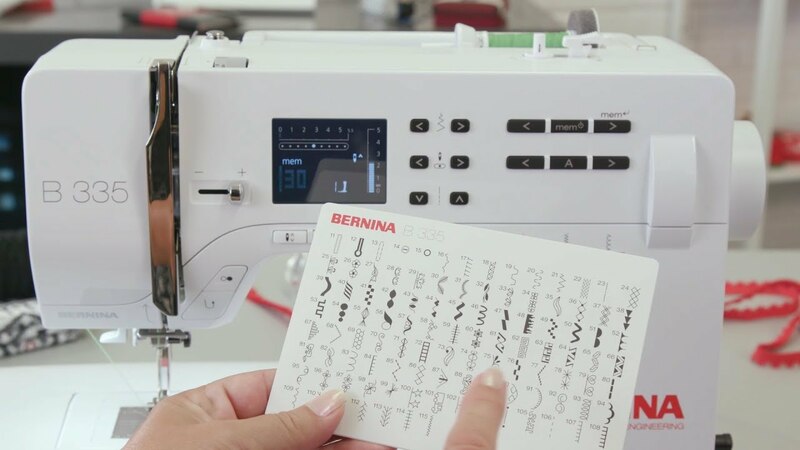 Convince yourself what makes the BERNINA 335 so special. Your local dealer will be happy to assist you and to answer all your questions. Being a sewist, a maker, a creator is serious business. When it’s time to make, your creativity deserves the support of a great machine.